This is an unusual print for Ernest Haskell. Most of his known work is from the American Northeast and California. He is known to have visited Florida in 1914, and this probably dates to that period. It is also unusual in that it is extraordinarily dark (many of Haskell's etchings are extremely light and atmospheric). He acheives the effect with copious use of drypoint, as well as generous use of ink on the plate. It truly captures the sensation of being deep in a southern swamp. It really demonstrates Haskell's range as an etcher. 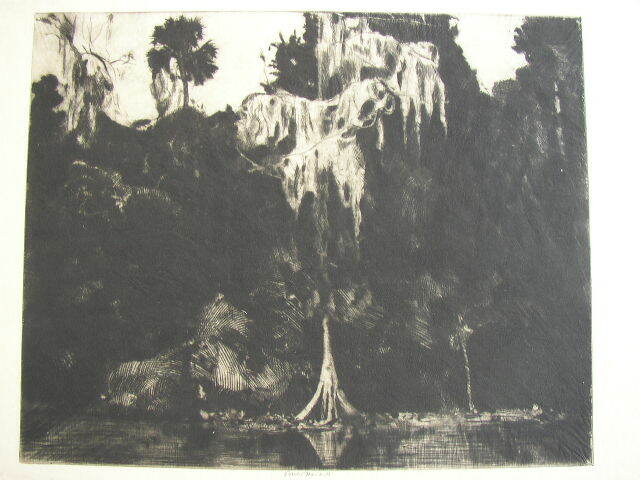 It is signed in pencil at the lower center of the etching. A really great piece in a typically small Haskell edition. Excellent. Good impression. No foxing or staining. The etching is archivally matted and protected with mylar.